Stars burn hot, bright, and then go out forever. But their legacy remains. Like the smoky haze of a rock-n-roll arena show, a cloud of mystery and intrigue surrounds music’s infamous 27 Club. Some of the club’s more famous members include Jim Morrison, Janis Joplin, Jimi Hendrix, Kurt Cobain, and Amy Winehouse, among many others. These fallen stars revolutionized music in their youth, only for all of them to die at the age of 27. Is it a conspiracy, or merely a coincidence? A rocking crew of 54 comics creators were challenged to use their favorite song or member of the 27 Club as inspiration for new and original comic stories and vignettes. 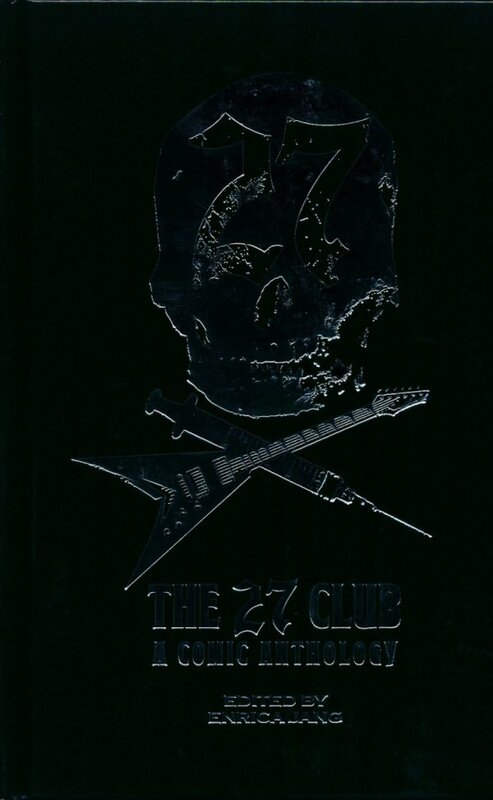 The 27 Club: A Comic Anthology is a free-form, funky collection of over 200 pages of rock-n-roll comics, featuring over 27 new grooves inspired by, and in tribute to, the myth and magic of this club of lost stars and their shining, tragic legacy. Original comic stories, illustrated essays and art inspired by the music of: Amy Winehouse, Kurt Cobain (Nirvana), Jim Morrison (The Doors), Janis Joplin, Brian Jones (The Rolling Stones), Alexander Levy (composer), Robert Johnson, Rudy Lewis (The Drifters), Dave Alexander (The Stooges), Richey Edwards (Manic Street Preachers), Kristen Pfaff (Hole), Jean-Michel Basquiat, Jeremy Michael Ward (Mars Volta), Helmut Kollen (Triumvirat), Mia Zapata (The Gits), Alan Blind Owl Wilson (Canned Heat), and more. Edited by Enrica Jang (Red Stylo Media), with introduction by Dr. Dianna Kenny, author of Stairway to Hell: Life and Death in the Pop Music Industry.